What NOT to Do If You Find A Bee Swarm? I’ve Had A Bee Swarm Removed But There Are Still 100 or So Bees Flying Around. What Should I Do? 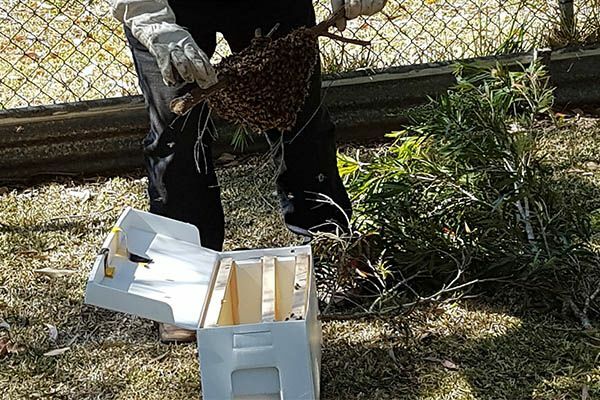 What Does It Cost To Have A Bee Swarm Removed? 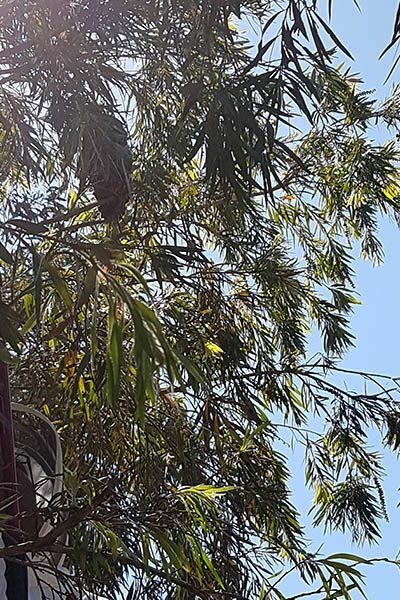 I See Some Bees Hovering Near My Window, Is This A Swarm? 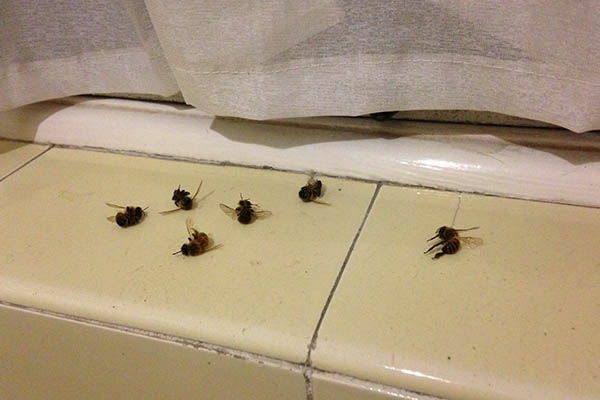 There Are A Few Dead Bees On My Window Sill Or In My House. What Should I Do? How Long Do Bee Swarms Last? I’ve Noticed A Lot Of Bees Entering A Hole In My Brick Wall. What Should I do? What Is A Bee Swarm Exactly? What Causes Bees To Swarm? How Many Different Types Of Bee Swarms Are There? What’s A Prime Bee Swarm? What’s A Secondary Bee Swarm? What’s An Absconding Bee Swarm? Can A Beehive Swarm More Than Once? Can A Beehive Swarm More Than Twice? Where Do Bee Swarms Go? Where To Find Bee Swarms? Where To Catch Bee Swarms? 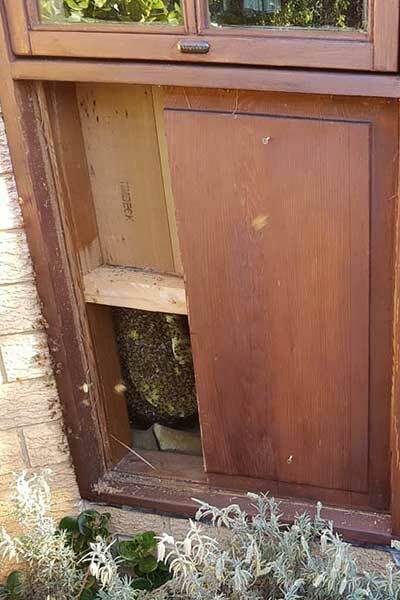 There Are Bees In My Possum Box. What Should I Do? How Big Is A Bee Swarm? How Many Bees Are In A Bee Swarm? How Much Does A Bee Swarm Weigh? 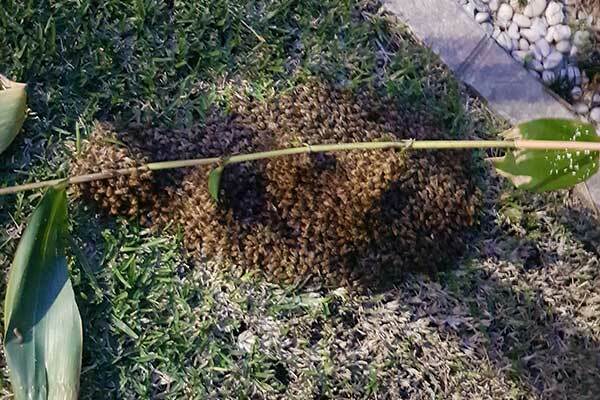 There’s A Bee Swarm In My Yard, What Should I Do? How Long Do Bee Swarms Stay? What’s the Difference Between A Bee Swarm & A Bee Nest Gathered In A Tree? How Far Do Bee Swarms Travel? How Can I Trap A Bee Swarm? Where Can I Get More Info On Bee Swarms? How Are Bee Swarms Collected? There are different types of bee swarms and many characteristics of a swarm. Over the past few years, in particular, we’ve collected more than a few. 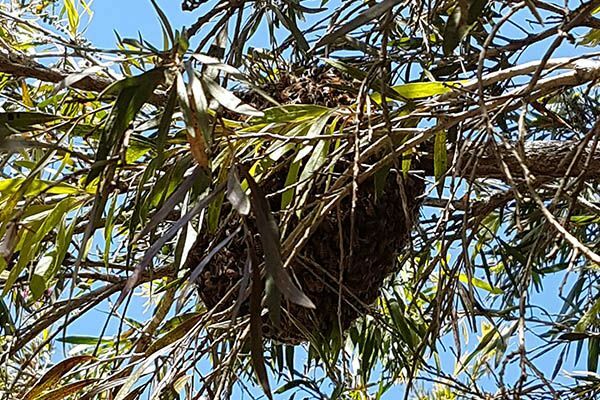 And we have witnessed very different situations from swarms on backyard swings, to bees up a telegraph pole, in a tree, on the bonnet of a car and even a bee swarm inside a letterbox. 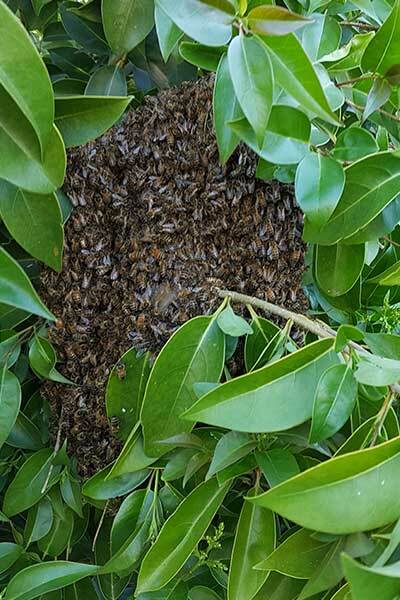 These are common questions about swarms and what to do when you see one or have a swarm removed. 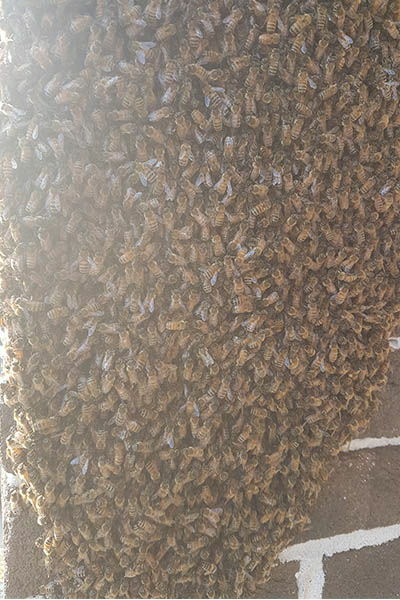 I’ve Got A Bee Swarm, What Should I Do? If you have a bee swarm and want it removed you should act fast. You can contact a local beekeeper or beekeepers association. An experienced beekeeper will know exactly what to do and preserve the bees. The swarm will most often be taken away and rehomed into a beehive. If an exterminator or pest controller is called it may mean the bees will be exterminated so it’s best to consider contacting a beekeeper first. If you don’t know how to contact a beekeeper, try your local council or government authority. If you represent a beekeepers association or club and you’d like to be added to our list, please contact us with your details. Get A Bee Swarm Removed Now! 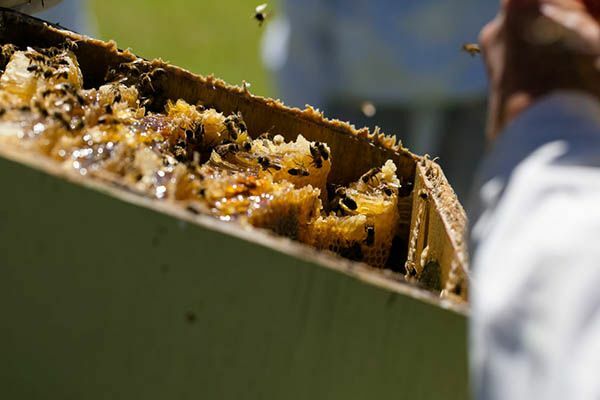 Below are a good collection of beekeeping associations around Australia that offer bee swarm removal service and advice. Choose the association in your area and find local beekeeper there. AUSTRALIA TAS: Tasmanian Beekeepers Assoc. Don’t panic. Bees are generally at their most passive state when swarming. They will most likely not attack if they are not provoked. Don’t spray the bees with insecticides or water. Bees sprayed can often provoke them to sting you. It is quite common to see more than a few bees over the next day or two flying around where a swarm was previously. These are usually scout bees that leave the swarm temporarily looking for a good nesting spot. When a beekeeper comes and removes the swarm, the scout bees that are out and about, return to the swarm spot and find the swarm has left. They will often disappear within a few days and return to their original beehive. If the bee swarm is easily accessed and you call a beekeeper, generally it will cost you very little if anything at all. However, if you call a professional exterminator or pest control specialist, there will most likely be an hourly charge. It’s best to ask first when you call in someone for help. If this is about 20 or so bees, no it’s not a swarm. But if you see this in spring to autumn it’s likely that these are scout bees. These bees are the first bees deployed from a hive to scout out a suitable place for the bee swarm. It’s also a good indication a swarm may arrive soon if the scout bees determine a place is a good option for the swarm. It is also typical to see the same behaviour of these scout bees every year as the weather warms up in early spring. These are probably scout bees that have died from exhaustion. You can try to spray common almond essence as a deterrent around gaps or small entrances to your home. Also, consider plugging up gaps in windows or brickwork with cloth jammed in the gaps. This may prevent more scout bees and a swarm arriving. However, if the bees are determined enough, they may return. 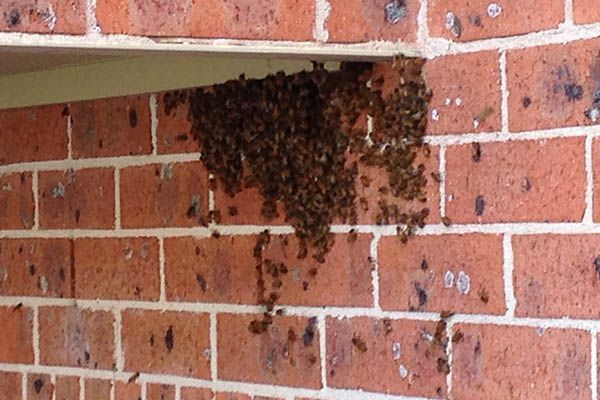 Usually, a bee swarm will settle in a tree or on a brick wall as a transient measure. They can stay for a few hours to a few weeks before moving on or staying and establishing a colony. As soon as you notice this you should call a local beekeeper. If you leave it long enough they may establish a nest and make the space between your brick walls their new home. New bees will emerge from their cells 21 days after the queen lays her eggs. And the queen can lay up to 2,000 eggs a day. So if you don’t take swift action, the numbers of bees will grow very quickly. People are a little unsure but most often fascinated by bee swarms. And that means there’s always a lot of questions to answer. So we have decided to publish a list of the most common questions and answers together on one page. Bee swarms are a marvelous phenomenon of nature. Swarms generally occur each year during the peak season. Swarming is a bee colony’s method of multiplying and rapidly growing in numbers. Another colony is created when a bee swarm succeeds and it occurs to support the survival of the bee species. In simple terms, swarming can be thought of as bee colony reproduction. However, some colonies may swarm multiple times. And to the extent that the parent colony will not survive. Some schools of thought believe swarming is an exploration of forage and the suitability of conditions in areas that are adjacent to the swarming colonies original location. Sometimes when swarming reoccurs until there are no bees left, there can be five or more swarms and each swarm head in a different direction. These different directions may suggest that the bees swarming are aware of previous swarms that were issued hours or even days before. And different directions are traveled perhaps to avoid competition with previous swarms. In this example, bees may not be simply propagating their race, but exploring the landscape of a given area. Swarms that discovered a good environment to exist would thrive whilst other swarms would fail. The location of the original colony was not important and a daughter colony would later re-occupy the site. Congestion. Overcrowding can drop the availability of queen pheromone to her colony. This can stimulate the worker bees to prepare for a new queen by constructing queen cells. An Aging Queen. As with most other animals that age, when a queen gets old her fertility starts to fail. Thus producing fewer eggs and bees. 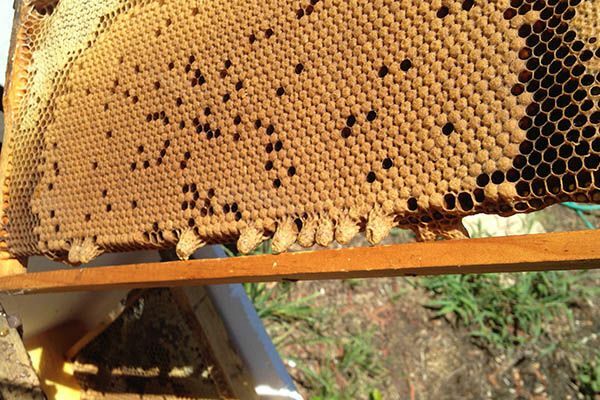 This may cause the workers to decide they need a new queen to sustain a good flow of new bees in the colony. Poor Nectar Availability With High Pollen. As more pollen comes in, the nest will grow rapidly. Worker bees that are usually making honey are idle thus overcrowding the brood box of a beehive. Genetics. Different strains and races of honeybees can swarm more often than others even when the weather and other environmental factors are the same. The prime bee swarm is the first bee swarm to leave the hive. Often a hive will only swarm once in the peak season, therefore, the primary swarm is the most common. A primary swarm is typically about the size of a soccer ball or bigger. It typically has 25,000 or 50% of size of the parent colony. About 100 male bees (drones). And the original mated queen bee. Also known as an after swarm, secondary swarms occur after the prime swarm. When bees are preparing to swarm there will often be many queen bee larvae in the colony. If these virgin queen bees emerge from their queen cells, one queen may leave with half of the colony. For example about 12,500 bees. 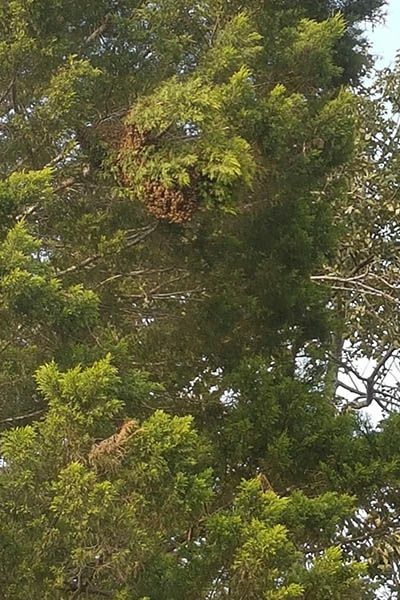 This type of swarm is about half the size or less than a soccer ball, the secondary bee swarms are less common. If they do occur, they will follow a few hours or even a few days after the primary swarm has fled. These swarms contain a young virgin queen. Less frequently, secondary swarms can sometimes re-occur and will reduce in size by about 50% each time. These rarely occur but over recent years they have been known to occur more frequently. Absconding bee swarms are the result of problems in the beehive such as starvation, pests overtaking the hive, or disease. In this case, very few if any bees will be left in the beehive. A phenomenon called Colony Collapse Disorder (CCD) can sometimes be referred to as absconding bees. Yes. 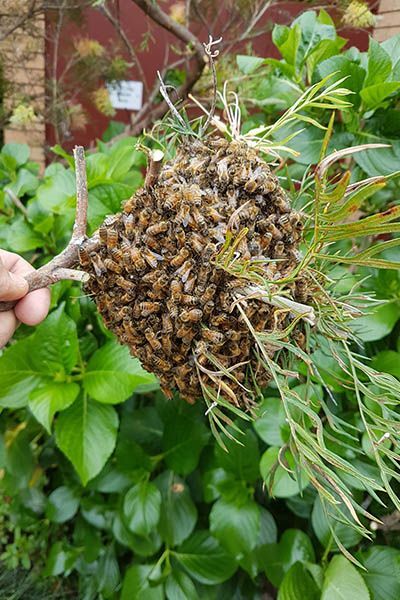 Bees can swarm several times in a matter of days depending on many things including food supply, the season, the availability of a queen or queens and drones. Yes, it does happen but less frequently. This is commonly referred to as an after swarm. And each time a swarm is created, it usually consists of approximately 50% of the bee colony. Therefore if the original colony is 50,000, the primary swarm is 25,000. The secondary 12,500. The third 6,250. The fourth 3,125 and so forth. 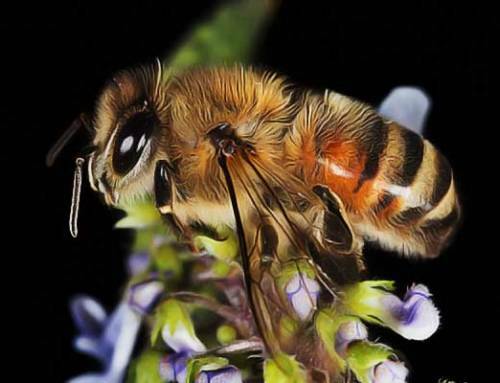 In general, the smaller the number of bees, the less chance the bees will have of surviving. Once a bee swarms from its original hive, it will find a nearby tree or sheltered area to attach itself to. Bee swarms are often found less than 100 metres away from a beehive. If you want to buy a bee swarm that has already been collected, contact your local beekeeping association. Beekeepers often collect swarms during spring to early autumn and are readily available to other beekeepers. Bee swarms can be caught once they have settled into a cluster. For example, attached to a wall or a tree branch. Catching a bee swarm is a lot more difficult if the bees are in flight and not yet settled in a cluster. It’s more common than most people would think, but bees do sometimes occupy boxes that are meant for possums. We have seen bees fill possum boxes to form a nest as small as a shoe box to as big as a metre tall. 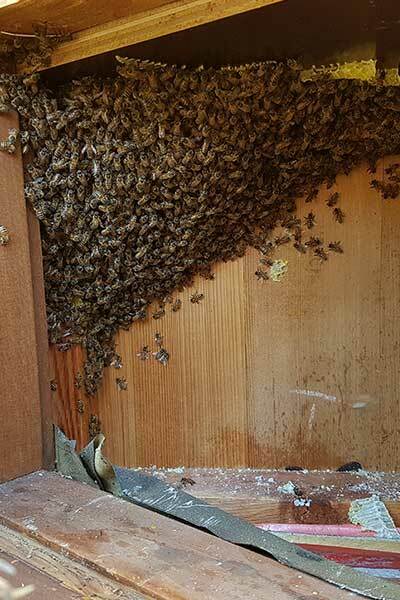 If the bees in the box do not pose a risk for people, they can be left there. However, if the bees do become an issue you can call a local beekeeper to give you an opinion. Honey bees are the most popular for swarming. A bee swarm typically consists of one queen bee, less than 50 drones (male bees) and thousands of worker bees. These are the bees that have divided from their existing colony. A swarm cluster can be as small as an orange or as large as a beach ball. This is dependant on many things. But typically it will be about 50% of the colony. This is roughly 25,000 to 30,000 bees in a swarm. 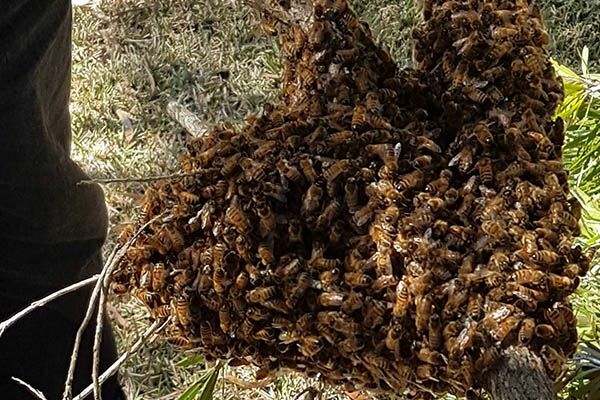 It’s said there are about 10,000 bees to the kilo but a swarm of bees are a little heavier because they are often loaded with honey they have gorged before swarming. So typically the most common bee swarm, the prime swarm, will weigh about 2.5kg. The queen bee pheromone is the strongest attractant to a bee swarm. Other swarm attractants include lemongrass or lemongrass essence. These are often included in a swarm lure. 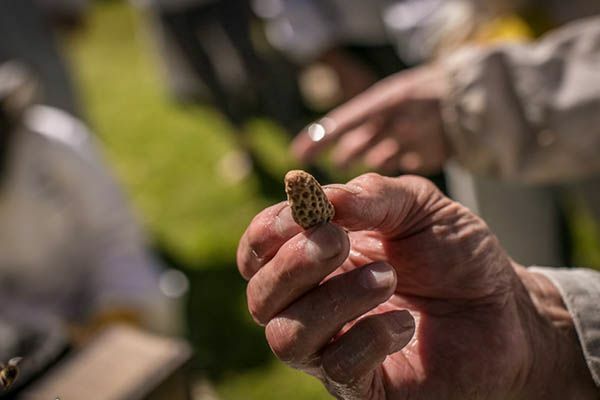 Many beekeepers have recommended using pure almond essence to discourage bee swarms from settling in an area. Almond essence can be found at most supermarkets in the baking section of your local supermarket. You can simply spray around windows or brick wall weep holes with a diluted 1 to 1 parts mixture of water and almond essence. Call your local beekeeper or beekeeper association. An experienced beekeeper will know exactly what to do and preserve the bees. The swarm will most often be taken away and rehomed into a beehive. If an exterminator or pest controller is called often the bees will be exterminated so it’s best to consider contacting a beekeeper first. If you don’t know how to contact a beekeeper, try your local council or government authority. When bees first leave their colony in a swarm, they will find a transient location waiting for the other bees to gather. A bee swarm can stay from a few minutes to a few days. 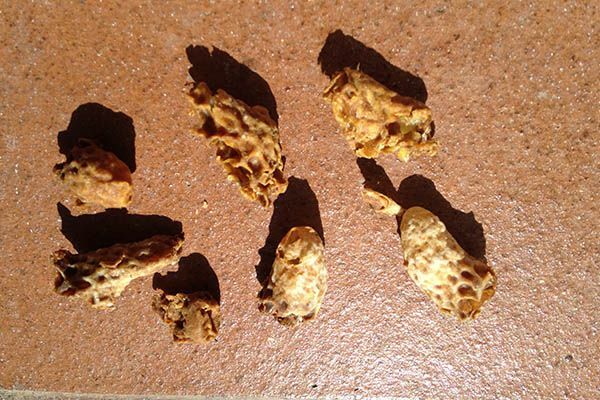 A bee swarm does not fly with eggs, larva or honeycomb. 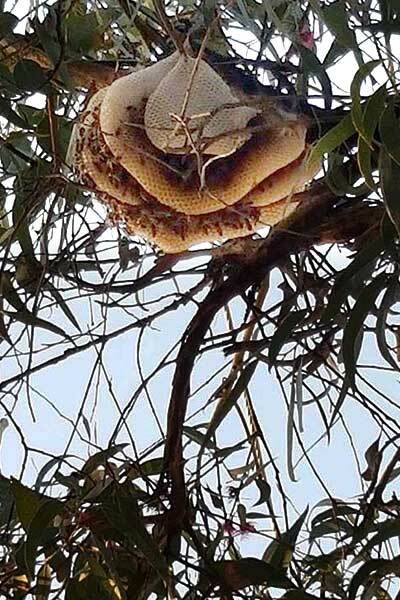 So if you see a cluster of bees in a tree with honeycomb, it’s a nest. 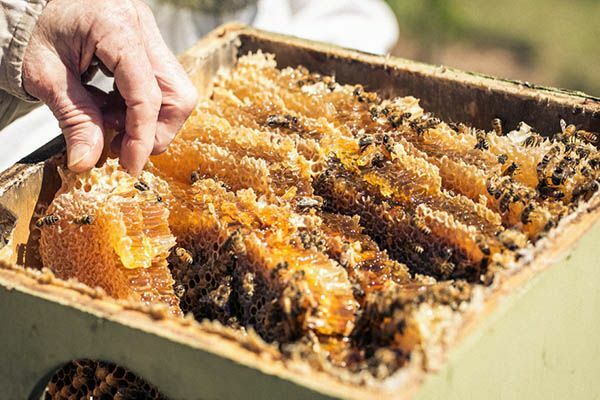 And it is either contains all the bee products used in a beehive like eggs, larvae, and honey, or it soon will. Bee swarms can travel for kilometers but will most often travel to the nearest and most ideal place to settle. 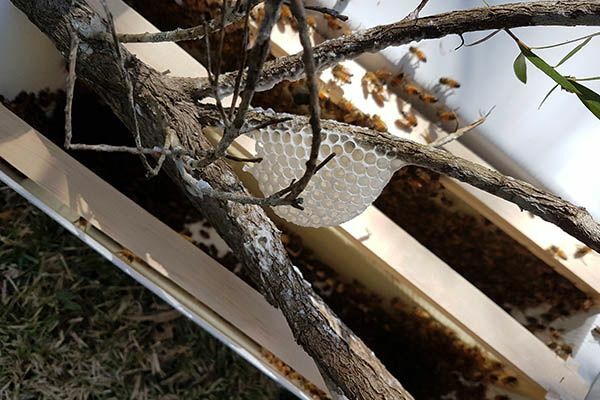 A swarm lure can be used in a bait hive, usually a box with the ideal volume of empty space that bees need to build their new colony. This often simulates a bees natural environment like the hollow of a tree trunk with a small entrance to allow bees to enter and defend against predators. 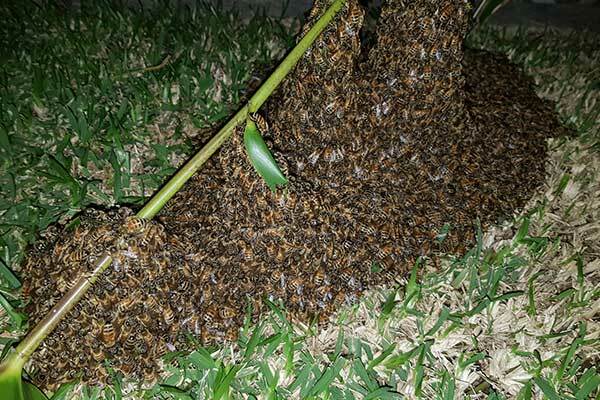 How To Catch Bee Swarms? A beekeeper will often take a small box called a nucleus to collect bees. It’s about half the size of a typical beehive box and ideal to contain and transport the bee swarm to a new location. How To Find Bee Swarms? Your local bee club will often have swarms available for beekeepers to purchase. 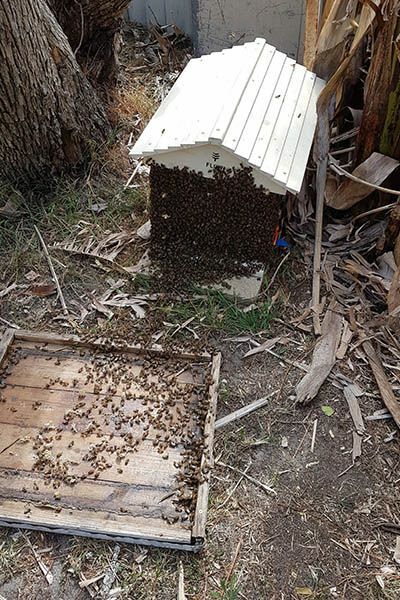 Bee swarms and their control – NSW Department of Primary Industries. Plus many books that explain a lot about bees and swarms. One of the best bee books you can find is Honeybee Democracy by Thomas D. Seeley. “A wonderful book, beautifully written and illustrated, about humanity’s greatest friend among the insects”. This really depends on where and how the bee swarm has settled. For example, if it is knee high in a lemon tree it will likely be a lot easier to collect then a swarm high on the second story of a house. There are a few methods used and the most common would probably be using a small portable core flute box. Often called a nuc (or nucleus) box they are usually big enough for a swarm and small enough to transport on the front seat of a car. Ventilation holes with an entrance that can be opened or closed are 2 features of nuc boxes. The bees are placed into the box by shaking most of the bees in. Assuming the queen is near the centre of the swarm, if the beekeeper manages to place the swarm centre in the box, the other bees will soon join their colony. The 2019 weather in Sydney has been quite a mixture. Hot summer days, with very humid weather and late afternoon storms, have been common in 2019’s Summer period. Some very heavy rain followed by flash flooding around Sydney. The warm days and nights mixed with rain have seen a lot of growth too. Plenty of pollen and nectar has filled Sydney blooms so we’ve witnessed bees swarming over the summer months. And swarming has probably followed an unusual pattern this year. 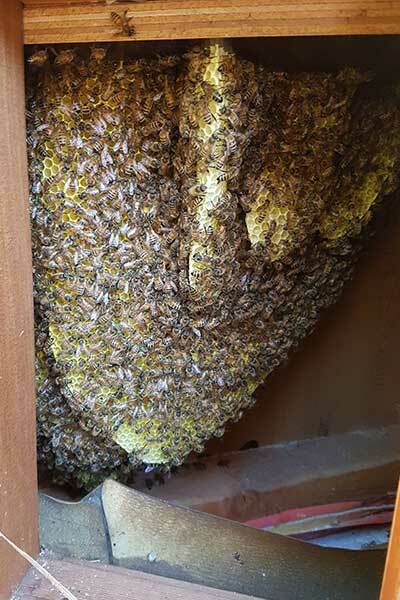 In January, we have collected more swarms and spoken to many beekeepers doing the same. So as we approach autumn, expect to see more swarming in and around Sydney and remember you can call on someone to help you and collect the swarm of bees. Remember to check out our handy beekeeper resources above. Perhaps this page can be used as a reliable place for people to go when they want to know about swarms. Plus it’s also a good reference to share with people after a swarm is collected. Yes, it’s a big list because bee swarms are quite complex. So hopefully, this list will go part of the way to answer any questions you have. But if you do have more questions, comments or even something to add just add your comments below. We’d love to share it with others. Note this list refers to honey bee swarms but some points can apply to other social bees. What a thorough and informative article Emmanuel. 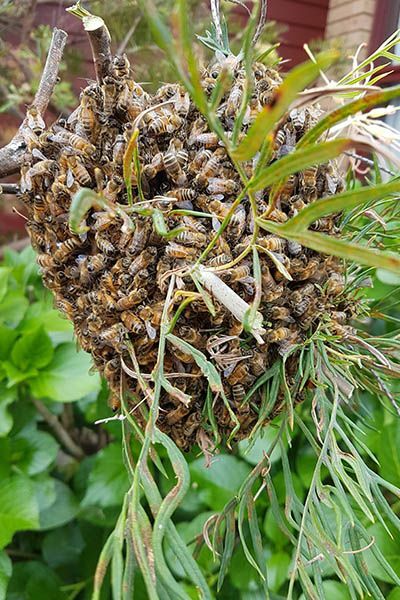 I’m so glad we had your help in re-homing our swarm! Was those first 2 photos our swarm?? Hi Paola. Yes, those photos are from your swarm. Although they proved to be a little difficult to collect because they were spread across the lawn, the swarm settled in quite well. 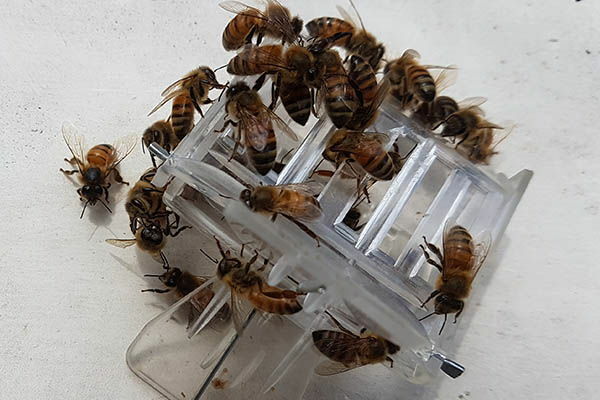 They will be relocated to a new apiary, after a short quarantine period to check on their health and the queens’ viability. Thank you for your concern for the bees. Wow it’s incredible how complex these little marvels are. Fantastic info and i love that bit on the possum box. I just hope they don’t kick out possums. Incredible amount of info. I had no idea bees were so clever. Last time I saw a swarm I couldn’t get a local beekeeper to collect it and they swarmed off the next day. Are there any beekeepers I can call on in ny? What an excellent web sight ….. absolutely packed with quality information & set out in an organised manner for obtaining information about particular topics. The links make it very easy to find a beekeeper to collect a swarm. What an excellent web site …… loaded with quality information & neatly organised categories for obtaining other information about bees & beekeeping. Hi Michael. Thanks for the great rap. Bees are a great subject, always plenty to know and share. Happy beekeeping to you. Great info. Wow I didn’t know bees were so intelligent. Thanks for sharing this.